Unsustainable. The one word frequently used to describe the current failure rates and level of innovation taking place throughout pharmaceutical R&D. With pipelines drying up and patents expiring, the industry is crying out for innovation. Whilst AI is not a new concept, it has newly broken into the mainstream conscious of drug developers as it matures and proves tangible value to transform and accelerate traditional drug development. The question is not will AI be the future of the industry, but how will AI shape this future? 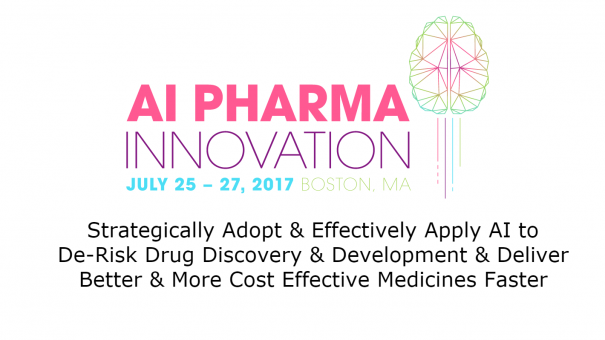 The AI Pharma Innovation Summit will showcase the real world application and impact of AI, machine learning, deep learning and cognitive approaches to unlock insight and value along the drug discovery and development pipeline to deliver better medicines with better outcomes. Meet experts and leaders from large pharma, biotech, technology companies and academic institutions who are all capitalizing on AI technologies to boost innovation and make smarter R&D decisions and investments.